While the government is for now allowed to resume normal operations, it is operating under the sequestration of funds. The sequester, which went into effect in March, is the result of the previous budget standoff between the President and congressional Republicans. It consists of across-the-board budget cuts so drastic that it was thought that the two parties would compromise rather than allow them to go into effect. This is not what liberals want. On January 15, the continuing resolution to fund the government expires and a new round of sequesters goes into effect. If the Senate and House agree on another “clean” continuing resolution, that will be in effect a victory for the conservative Republicans. I won’t call it a defeat for President Obama because his own stated goal is a “grand bargain” to reduce the deficit. Would the radical right wing of the Republican Party be satisfied with this? Will liberals and Democrats counterattack and, if so, how? Stay tuned. We live in interesting times. When I studied political science in college nearly 60 years ago, we were taught to contrast the sensible, pragmatic American and British political cultures with the ideological, gridlocked French and Italians. In France and Italy in the 1950s, governments fell and new governmental coalitions had to be formed every few months, or so it seemed, and the diverse political parties could never agree on policies to address their nations problems. But I never heard of any French or Italian political party that tried to stop their governments from carrying out their lawful functions or paying their lawful bills, as happened during the past couple of weeks here in the United States. Today it is we Americans who set an example of ideological, gridlocked government. Our Constitution sets up a legislative process that says enactment of a law requires agreement among a President elected by the nation, a House of Representatives elected by districts on a population basis and a Senate elected by states on a state sovereignty basis. That is a more complicated and difficult process than in most democratic governments. But now agreement among these three bodies is required merely to allow the government to carry out responsibilities mandated by law. Some smart people think the Republican Party is doomed because of the government shutdown debacle. 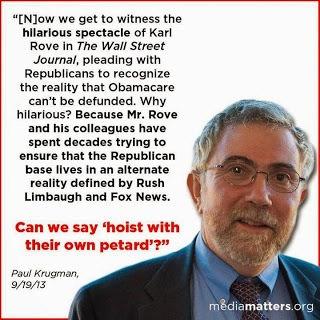 But Republicans have come back from worse than this. The Republicans came back from the failures of the George W. Bush administration, from the Newt Gingrich-led shutdown in the 1990s, from the Watergate scandals, and from the Goldwater defeat in 1964. So I think the Republican Party is going to be with us for the foreseeable future. American laws and customs make it difficult to challenge the two-party system. It’s hard for third party candidates to get on a ballot. Even when they do, few if any journalists take them seriously or give them equal treatment. 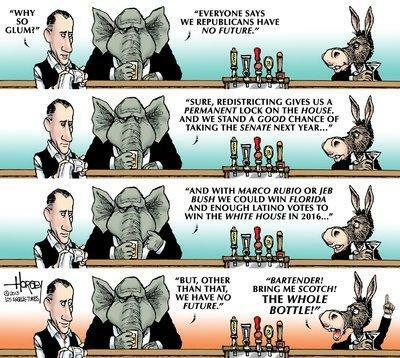 Both Democrats and Republicans have a solid base of supporters who will vote for them no matter what. I don’t see this changing any time soon. Republicans have a problem in that there is a conflict between their core supporters and their core financial contributors. The U.S. Chamber of Commerce and the National Association of Manufacturers don’t want the government to be shut down. But the Democrats have the same conflict between what their core voters want and what their campaign donors want. Silicon Valley and Wall Street donors won’t want a higher minimum wage, a better social safety net or higher upper-bracket taxes. Partly because the two parties are so much alike in their economic and foreign policies, voters tend to divide along ethnic, regional and generational lines. Demographic trends are running against the Republican Party, but party leaders have an answer to that: Rig the election against the demographic groups that tend to vote Democratic. Techniques include gerrymandering, voter ID laws and other restrictions and possibly tampering with hack-able touch-screen voting machines. This is reprehensible, but that doesn’t mean it can’t work. Franklin Roosevelt was elected in 1932 because the American people thought the Herbert Hoover administration was a failure. But he was re-elected in 1936 and set the stage for decades of Democratic power because of the popularity of the New Deal. The Democrats have no such positive program today. 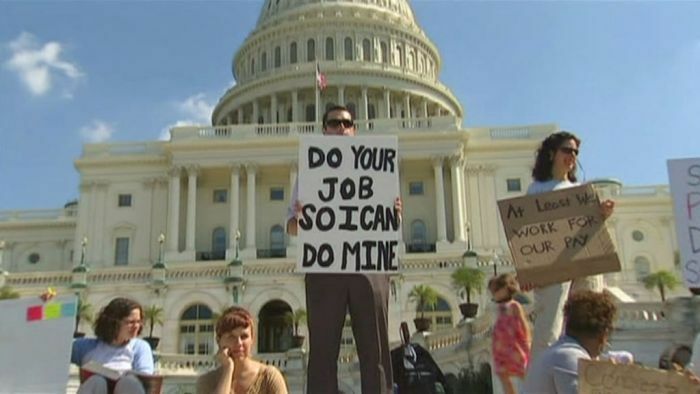 The Tea Party Republicans do stand for something, and have the courage of their convictions, as flawed as these may be. Democrats when in power—Jimmy Carter, Bill Clinton, Barack Obama—govern as if they were the Republican B Team, the replacements for when the Republicans mess up. The Washington Post had a good article the other day on the percentages of government workers furloughed in different departments. Here is the result of the Post report. State Department, less than 1 percent. 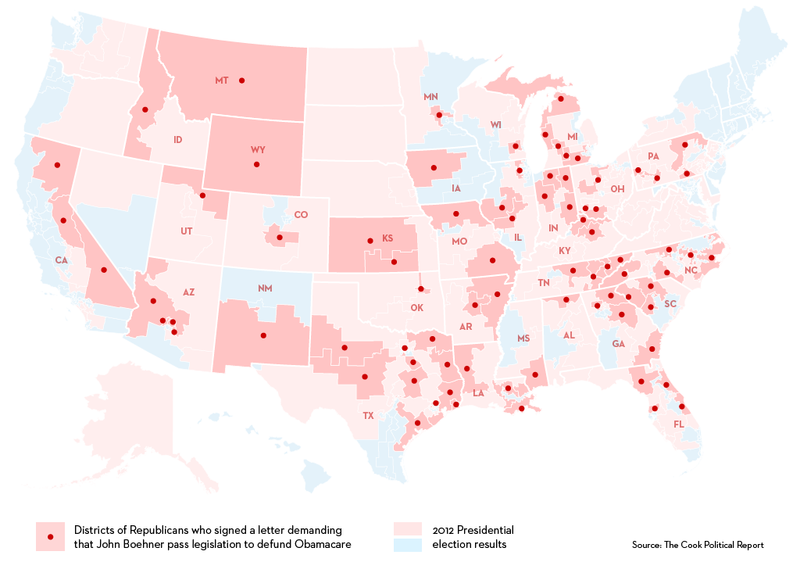 Barry Ritholtz on The Big Picture provided this map showing the overlap between those who want to block health insurance for poor people and those who want to shut down the government. What is actually being shut down? I read contradictory accounts of what governmental functions actually are being stopped. Until I get a clear picture, I will put a link to this post near the top of in my links menu on the right column of this page, and add to it as I get more information. Please use this as an open thread for information and comments about the shutdown. Top Ten Things Ted Cruz Did to the NSA and Other Security Agencies that Edward Snowden Couldn’t by Juan Cole for Informed Comment. I had assumed that the military and intelligence agencies would operate as usual, but Prof. Cole provided links to articles indicating that this is not the case. Fascist Priorities of the U.S. Government Shutdown by “libbyliberal” for Corrente. This writer said that all the governmental functions that benefit the top income earners will continue, but services to poor people and environmental, health and financial regulation are being brought to a halt. How the Shutdown Is Devastating Biomedical Scientists and Killing Their Research by Brandon Keim for Wired. How Iran and China Are Benefiting From America’s Shutdown by Romesh Ratnesar for Businessweek [added 10/6/13]. The State Department is unable to function normally to represent U.S. interests. The Government Shuts Down and the Microbes Win by Emily Willingham for Forbes [added 10/7/13]. Food inspections, medical research, tracking of diseases and the WICS nutrition program, which strengthens newborn infants against infectious disease, have all been shut down or drastically curtailed. Shutdown Standoff: One of the Worst Crises in American History by John B. Judis for the New Republic. What’s at stake is whether a political bloc has the power to bring the American government to a halt in order to get its way. If the Tea Party Republicans get their way, Judis warned, the U.S. government could become unable to function, leading to the rise of extremist parties of the right and left. I don’t think he exaggerates. Debt Ceiling Chicken and Trench Warfare by “Yves Smith” for Naked Capitalism. The United States may be in for a longer and more destructive political siege than anyone expected. Not only are there no plans for the two sides to meet, nothing is being done to prepare for discussions. The problem is that this is an either-or situation not subject to compromise. Either you recognize that a political faction has the right to crash the government, or you don’t. Republicans Are No Longer the Party of Business by Joshua Green for BloombergBusinessWeek. The government shutdown creates economic uncertainty and hampers the economic recovery. That’s why the U.S. Chamber of Commerce is opposed to it. Tea party lawmakers see the culmination of years of effort in shutdown by Zachary A. Goldfarb for the Washington Post. Since Barry Goldwater ran for President in 1964, members of the right wing of the Republican Party have seen the size of the federal government as the main threat to American freedom. 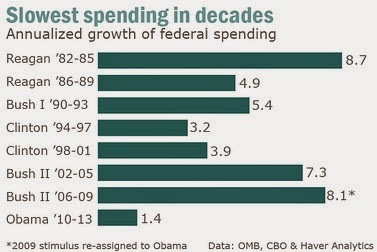 Ronald Reagan didn’t accomplish this, Newt Gingrich didn’t, George W. Bush didn’t. Now, at long last, the Republican small-government conservatives think they can accomplish their goal. 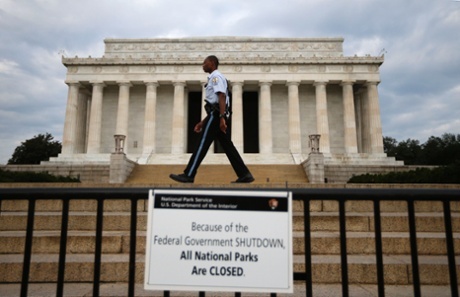 The real reason for the government shutdown by Dean Baker for Al Jazeera America. Baker said the Ted Cruz Republicans see this as their last chance to stop Obamacare, because it will be popular if it ever is allowed to work. The government shutdown could end today. All it would cost is John Boehner’s speakership by Chris Gilizza and Sean Sullivan for the Washington Post. Seventeen Republicans have said they’d vote for a “clean” continuing resolution, which would allow the government to resume normal functioning. They and the Democrats would be a majority in the House of Representatives. But if John Boehner allowed that to happen, he would lose his party’s support to be Speaker. The Shutdown in 10 Infuriating Sentences by Kevin Drum for Mother Jones. Kevin Drum demonstrated that the shutdown is not a result of equal stubbornness on both sides, but a faction of the Republican Party that intends to rule or ruin. Even if the shutdown ends, the government is operating under the budget sequester, which is a victory for right-wing Republican priorities in itself. The shutdown is a Constitutional crsis. 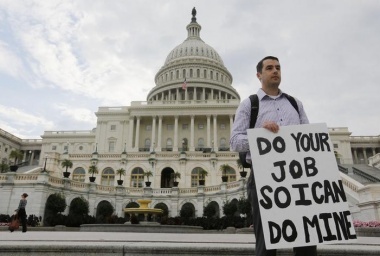 The government shutdown, and the impending government debt default, are Constitutional crises. If President Obama gives in to the threat, he will have set a precedent that will permanently undermine democracy and cripple the U.S. government. Threatening to shut down the government or force a debt default will become a normal political tactic. When I studied political science in college in the 1950s, my professors mocked the French Chamber of Deputies, with its continuing crises and deadlocks. They contrasted it with our American political culture, based on common sense, compromise and loyalty to the common good. But nowadays the French government functions well. It is we Americans who are in danger of becoming prisoners of ideology and gridlock. As “B Psycho” and Matthew Yglesias have pointed out, the government as a whole has not been shut down. It is business as usual for government employees with uniforms, badges and guns. [Update: Maybe not] It is only the employees whose work directly helps people who have been told to stay home. The WICS program, which helps low-income pregnant women and newborn infants, has been suspended. Experimental cancer treatment by the National Institutes of Health is on hold. If the shutdown runs too long, disabled veterans will cease to receive payments. 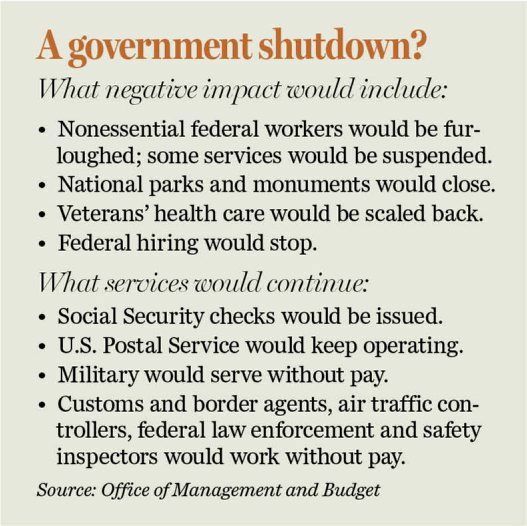 I don’t like this priority any better than they do, but law enforcement, civil order and national defense are core functions of government—they are defining functions of government—and given the fact of a shutdown, it is to be expected they will continue. I don’t think that a government shutdown should be used as leverage to change homeland security policy (not that anybody important is proposing to do so) any more than it should be used to change Obamacare. 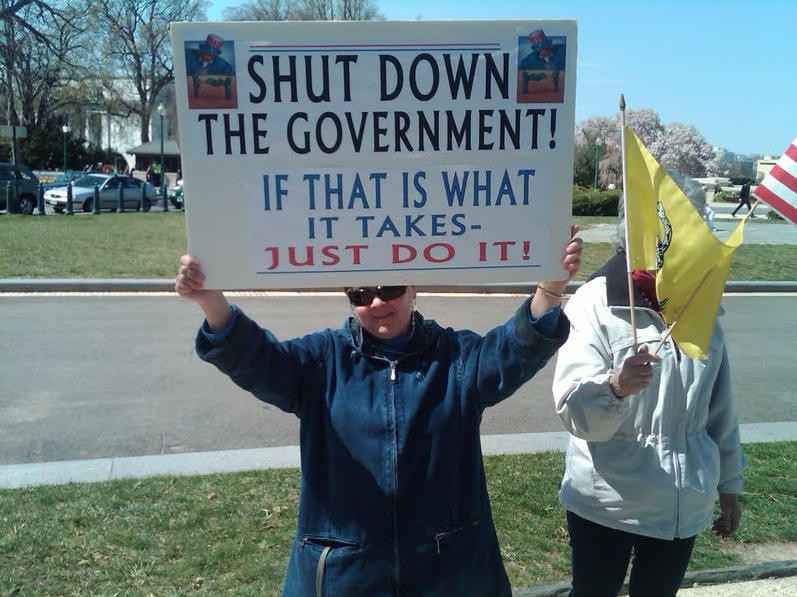 Shutdowns should not be allowed to become an accepted method of deciding policy. That’s why I think President Obama should stand firm in refusing “compromise” offers by the House of Representatives to fund particular government operations while continuing the overall shutdown. This is a backdoor way for them to force the Senate and the President to accept their priorities. The Republican caucus in the House shouldn’t be allowed to decide, all by themselves, which parts of the government should be allowed to operate and which parts shouldn’t. If the President backs down, then threats of shutdowns will become a substitute for the normal legislative process. The government will be in a state of perpetual crisis, unable to carry out policies or perform its lawful functions—although still able to spy on citizens, to persecute dissenters and to wage war. To people who follow politics these two facts are obvious. But they’re not part of most “tragedy of gridlock” false-equivalence stories, and I believe they would come as news to most of the public. So far House Speaker John Boehner has refused to let this vote occur. His Tea Party contingent knows how the vote would go and therefore does not want it to happen; and such is Boehner’s fear of them, and fear for his job as Speaker, that he will not let it take place. via James Fallows – The Atlantic. What If Voters Don’t Punish Extremism? by Ed Kilgore for Washington Monthly. Barack Obama has a history of standing aside and giving his opponents enough rope to hang themselves, then jerking on the rope. I think this is what he is doing in the government shutdown and debt default crises. Ed Kilgore thinks this might backfire in the current crisis. Voters are being told by that both sides are equally to blame—even though, in his opinion, the blame rests mainly with the Republicans. Shutdown Could Last Weeks by Jonathan Strong for National Review Online. Neither side is willing to back down. Obama insists on a “clean” continuing resolution to allow the whole government to keep functioning. Congressional Republicans plan to introduce “rifle shot” bills to keep specific government departments and programs functioning, but President Obama has said he will veto them (although he did sign a bill to continue paying active duty military personnel). Strong said it is not just a conflict between the President and the House Republican caucus. The real deadlock is between House Speaker John Boehner and Senate Majority Leader Harry Reid, who detest each other. The Individual Mandate and the Government Shutdown by Ian Welsh. Welsh argued that the Republican Obamacare proposal is reasonable. 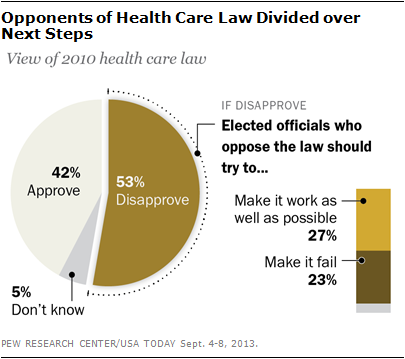 It did not suspend Obamacare, but only its most unpopular provision, the individual mandate to buy health insurance whether you want it or not. 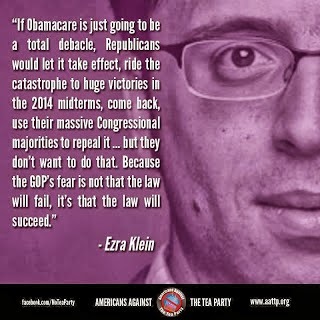 The problem with Welch’s argument is that, without the individual mandate, the complicated Obamacare system crashes. If the people who sign up for Obamacare are only people who are poor and already sick, the system cannot pay for itself itself. What Exactly Did Boehner Promise at Williamsburg? by Jonathan Strong for National Review Online. The House GOP’s Legislative Strike by Jonathan Chait for New York magazine. The Republican congressional caucus agreed in January to the Williamsburg Accords, an agreement to use the threat of a government shutdown and debt payment default to force President Obama to agree to their program. The current crisis is not an accident. It is part of a planned strategy. 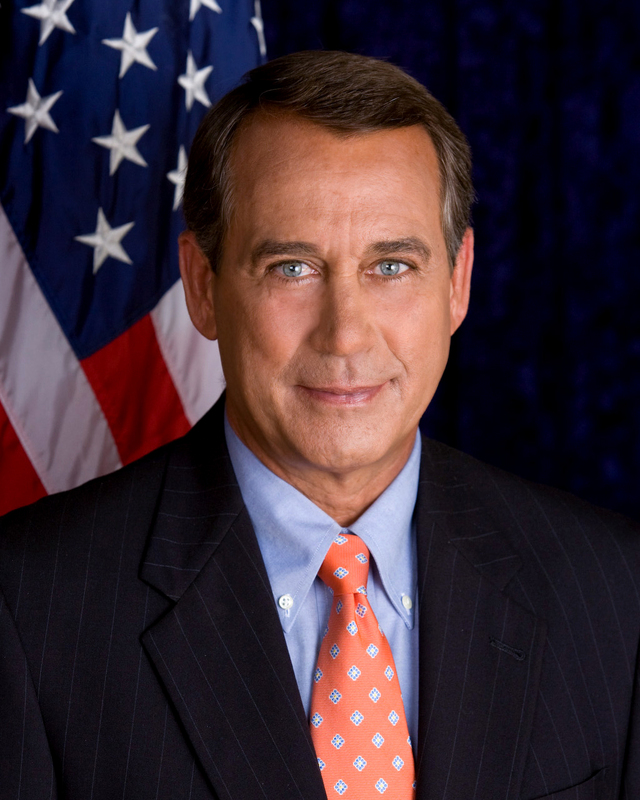 Why Boehner doesn’t just ditch the hard right?, an interview of Robert Costa, the National Review’s Washington editor, by Ezra Klein of the Washington Post. The Speaker of the House of Representatives has less influence on the Republican caucus than does the Tea Party or Fox News. Who to blame for the U.S. budget crisis? Try the Kaiser by Uwe Bott for the Toronto Globe & Mail. Once upon a time the President had to ask Congress for approval each time the government borrowed money. In order to pay for the cost of fighting in World War One, President Woodrow Wilson asked for, and got, approval to borrow money, up to a certain limit—the debt ceiling. Why doesn’t President Obama compromise? 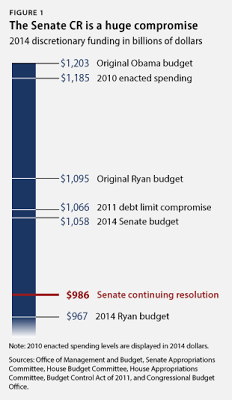 Why doesn’t President Obama compromise with the congressional Republicans on the budget? As the chart above shows, he already has compromised a lot—more, in my opinion, than he should have. The congressional Republicans say that the President is more willing to negotiate with the Iranian government than he is with them. I would say that the reason is there is more possibility of give and take with the Iranians than there is with the Republicans. It is the hallmark of a revolutionary party that when it runs candidates for elective office, it is not for the purpose of participating in government, but of undermining it. Revolutionaries do not regard governmental power as legitimate. The radical right-wingers in Congress, and their grass-roots supporters do not regard the present U.S. government as legitimate. They think it is a good thing, not a bad thing, when government ceases to function. So long as they hold that attitude, there is no point in trying to work with them. It is necessary to find a way to work around them.